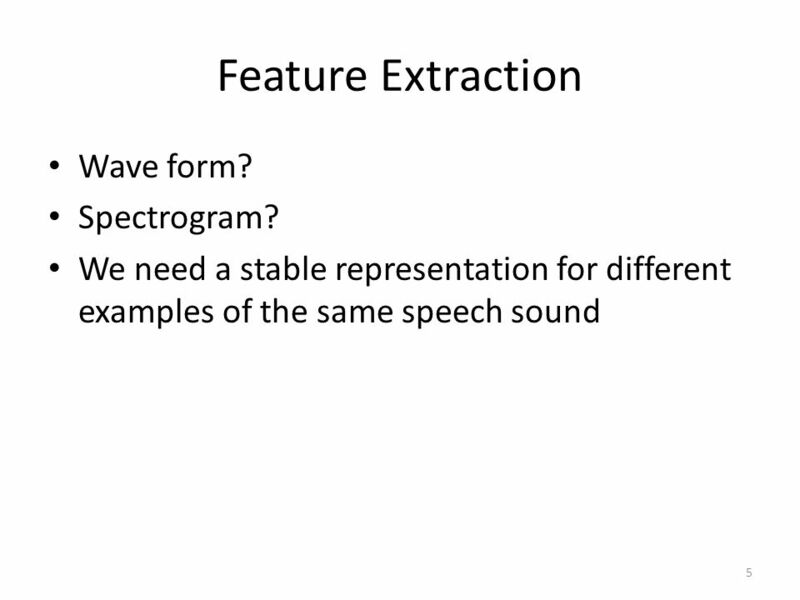 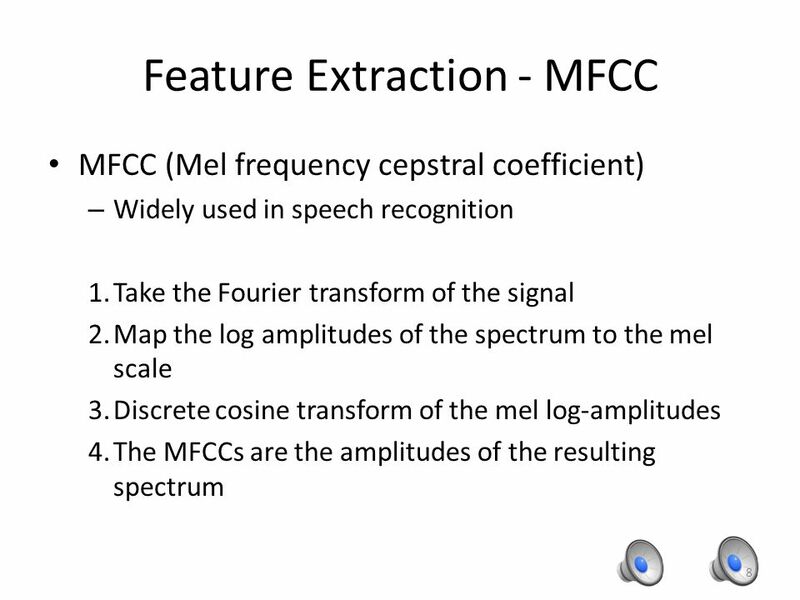 5 Feature Extraction Wave form? 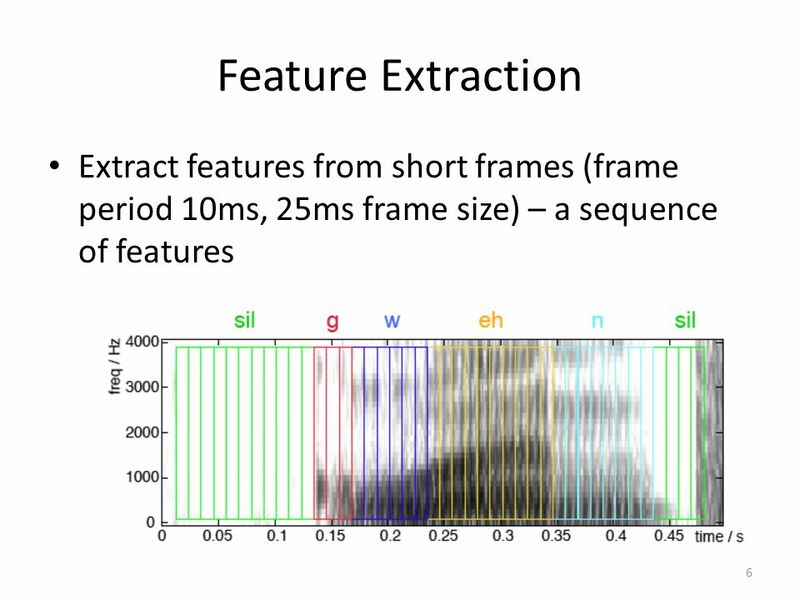 Spectrogram? 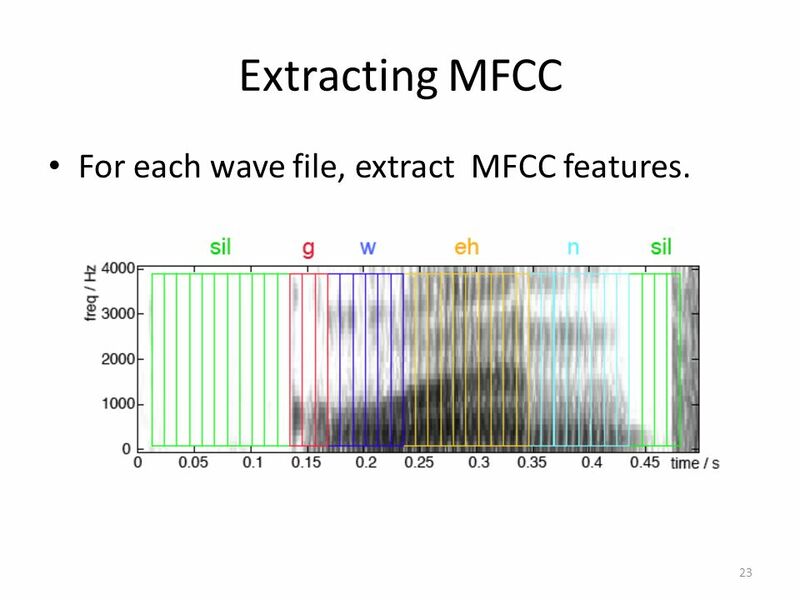 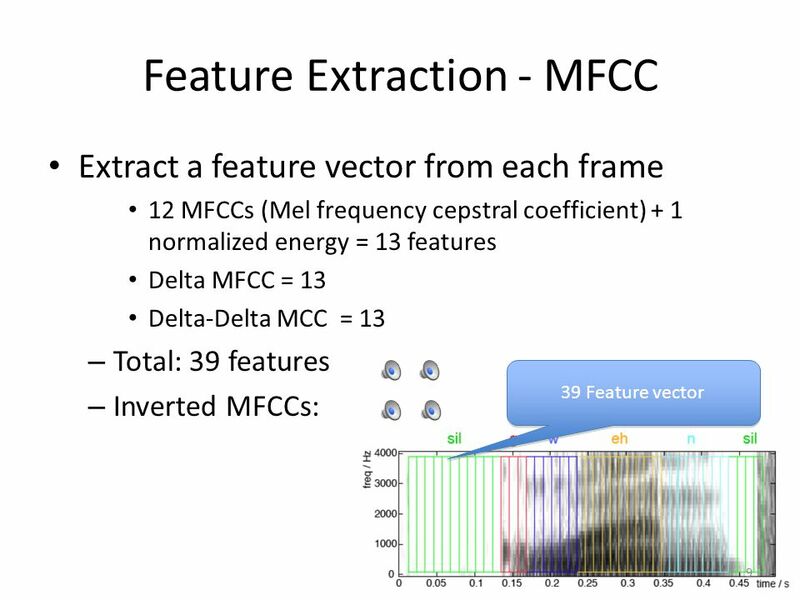 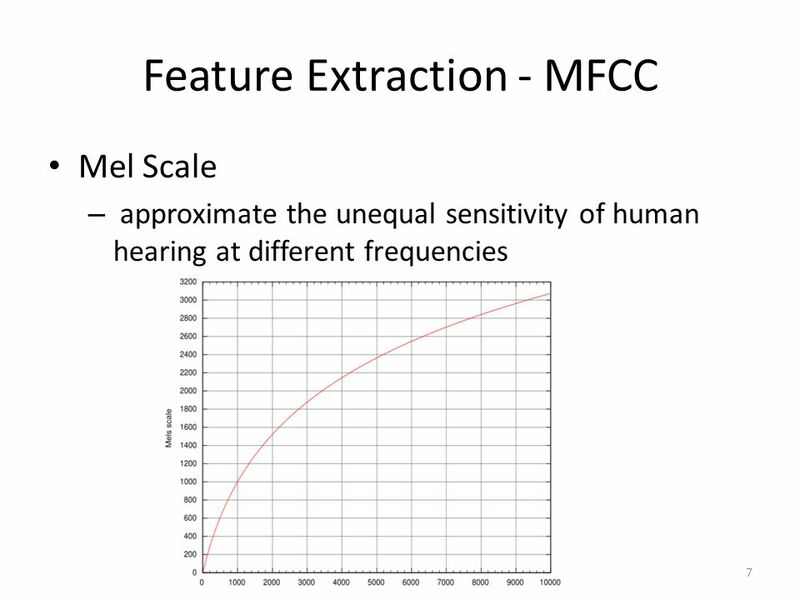 23 Extracting MFCC For each wave file, extract MFCC features. 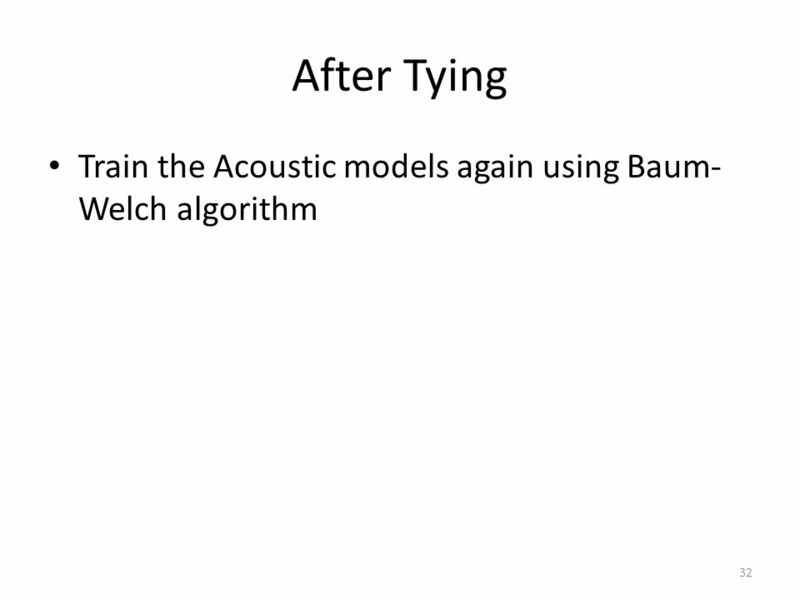 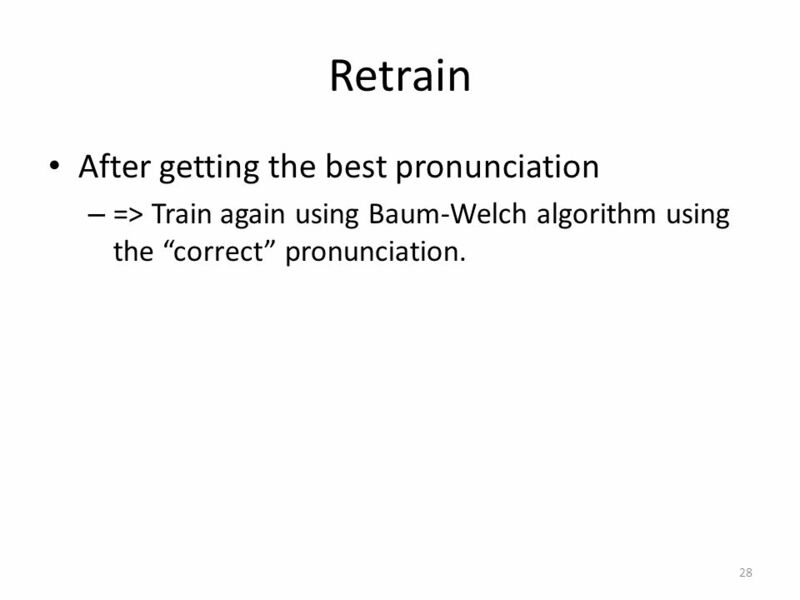 => Train again using Baum-Welch algorithm using the “correct” pronunciation. 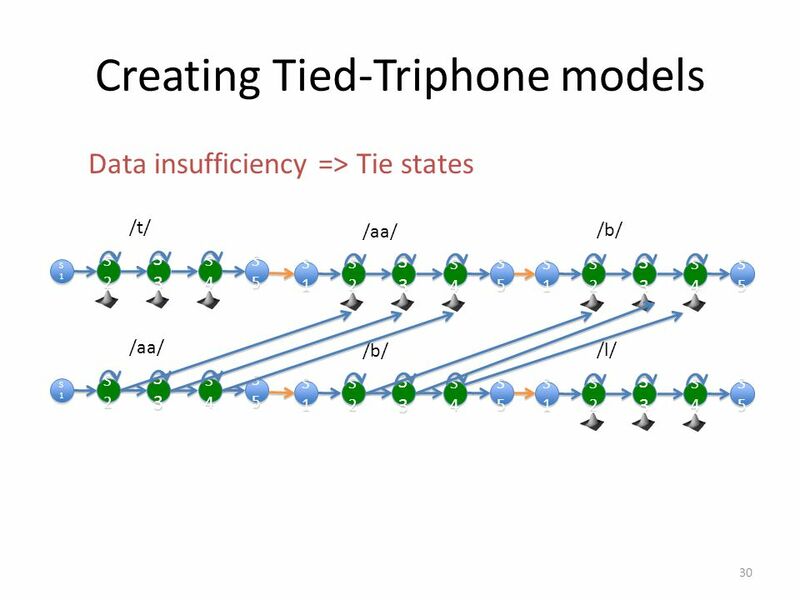 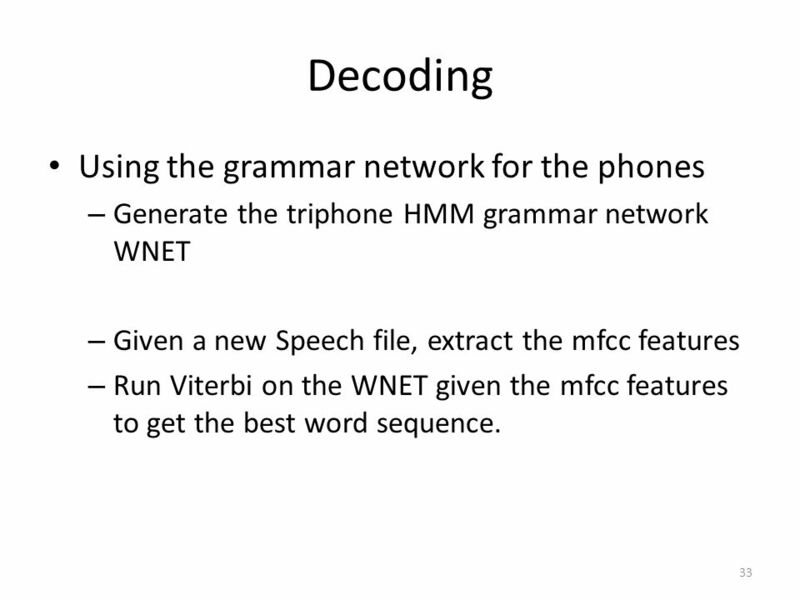 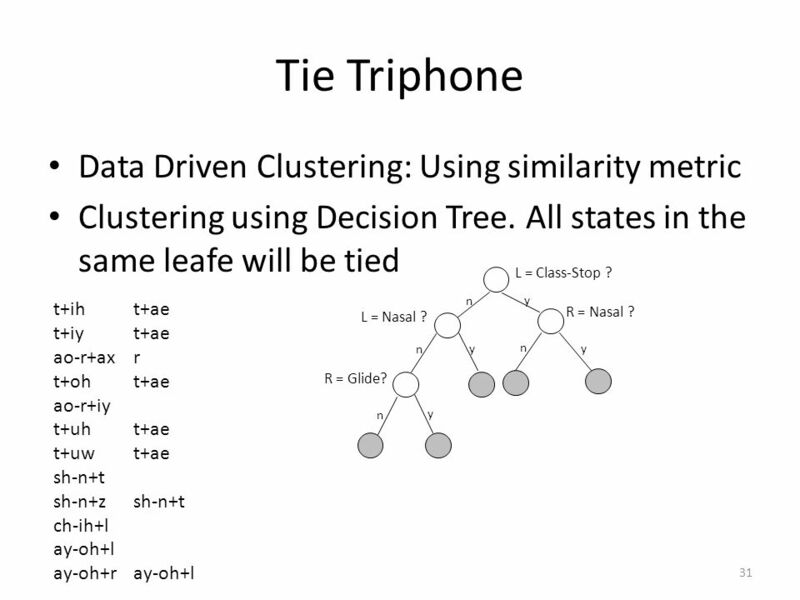 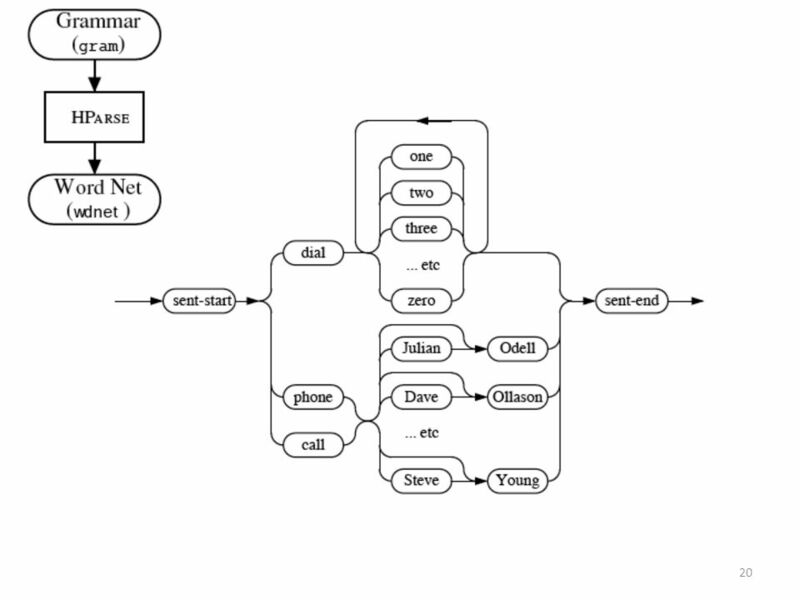 Generate the triphone HMM grammar network WNET Given a new Speech file, extract the mfcc features Run Viterbi on the WNET given the mfcc features to get the best word sequence. 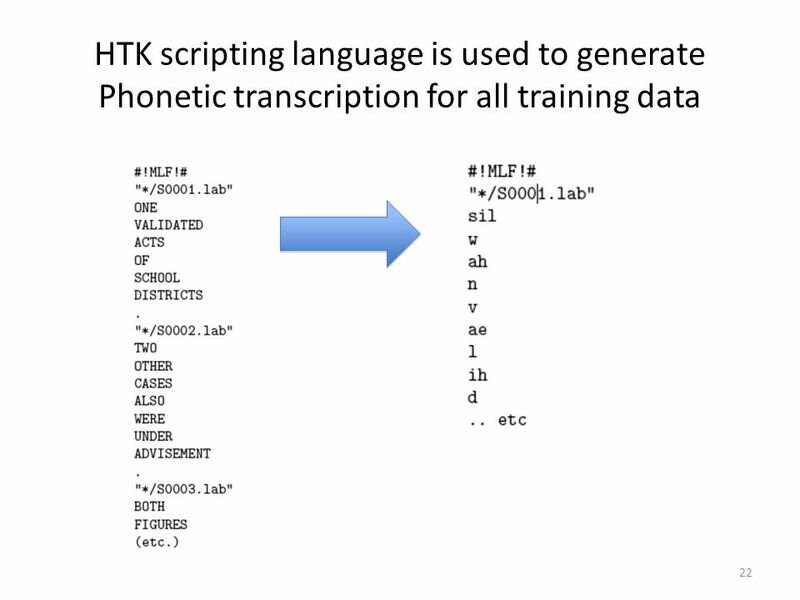 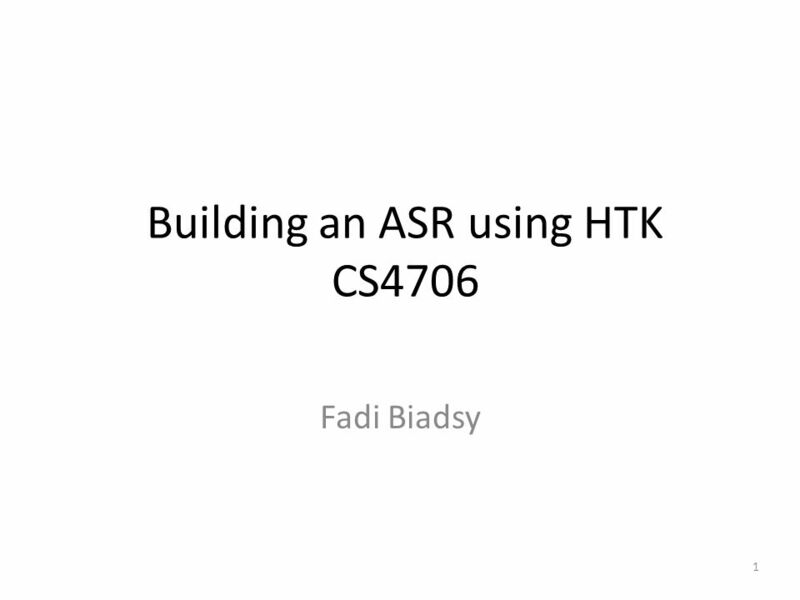 Download ppt "Building an ASR using HTK CS4706"
Speech Recognition Part 3 Back end processing. 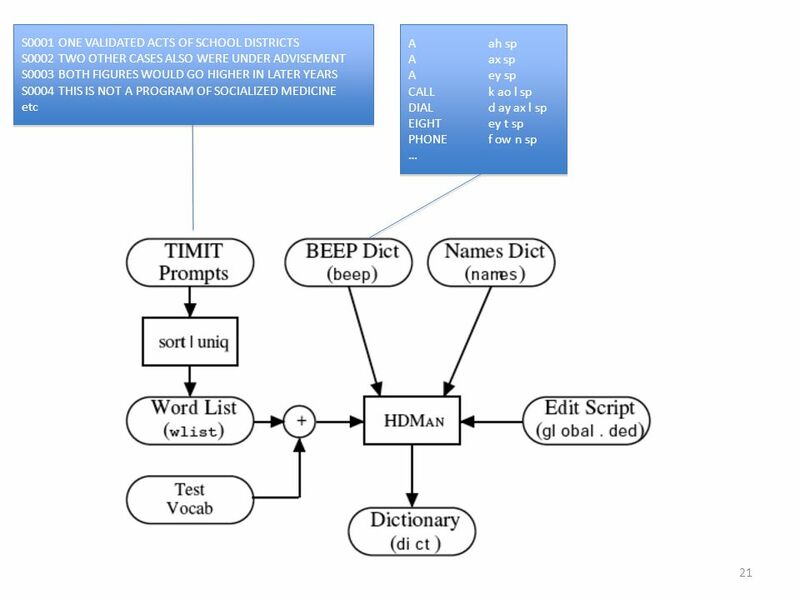 Speech recognition simplified block diagram Speech Capture Speech Capture Feature Extraction Feature Extraction. 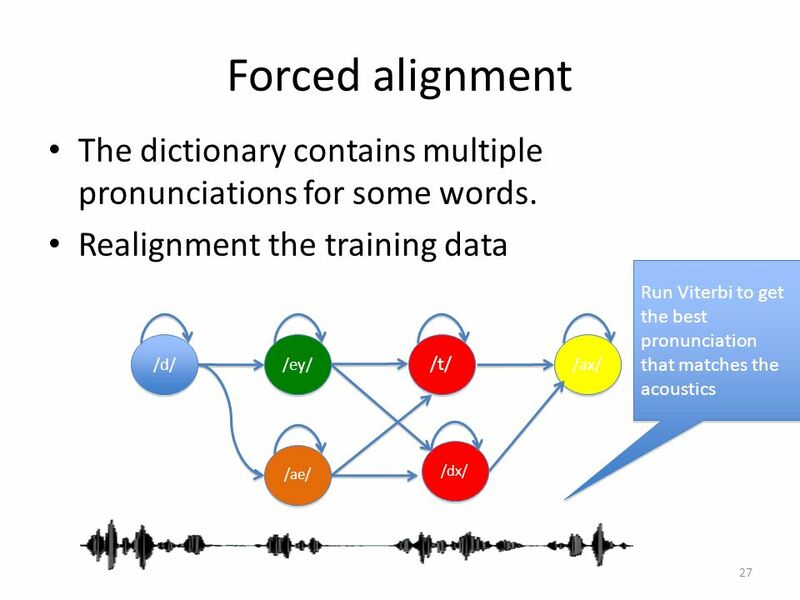 Acoustic Model Adaptation Based On Pronunciation Variability Analysis For Non-Native Speech Recognition Yoo Rhee Oh, Jae Sam Yoon, and Hong Kook Kim Dept. 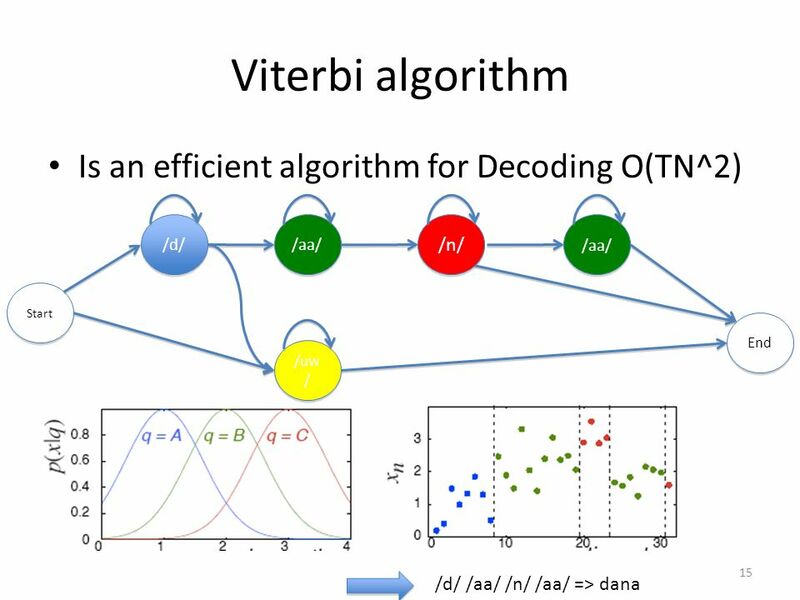 Frederico Rodrigues and Isabel Trancoso INESC/IST, 2000 Robust Recognition of Digits and Natural Numbers. 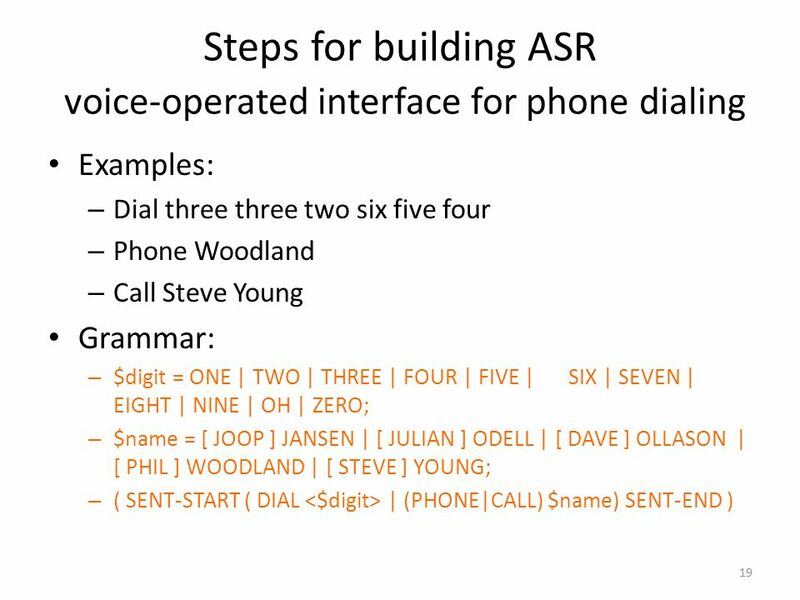 Using Motherese in Speech Recognition EE516 final project Steven Schimmel March 13, 2003. 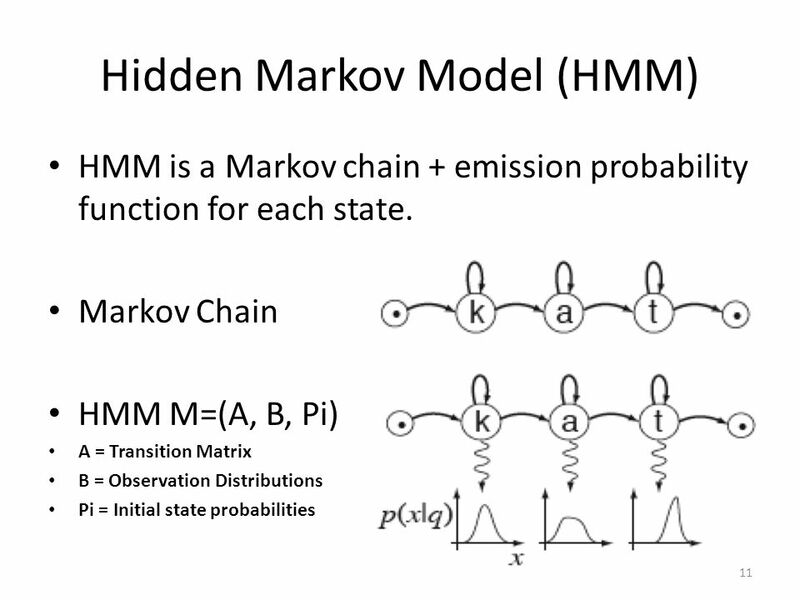 Hidden Markov Models Bonnie Dorr Christof Monz CMSC 723: Introduction to Computational Linguistics Lecture 5 October 6, 2004. 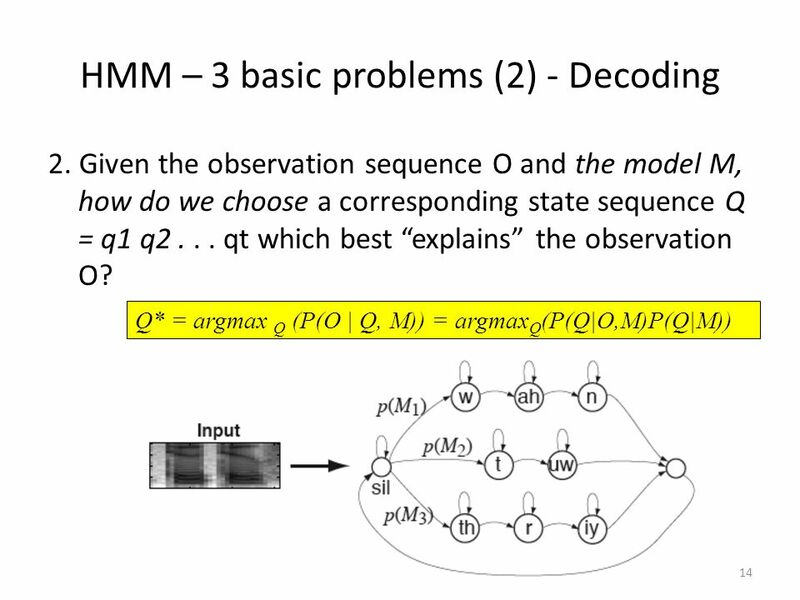 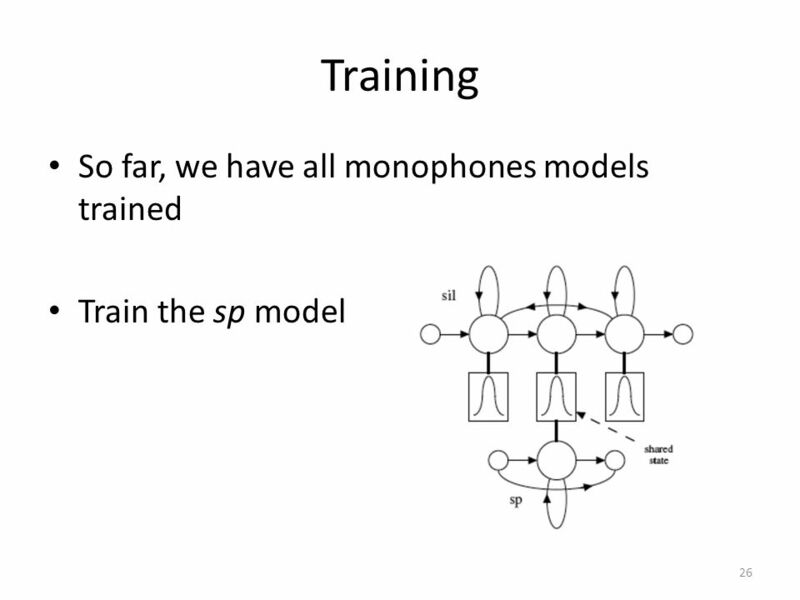 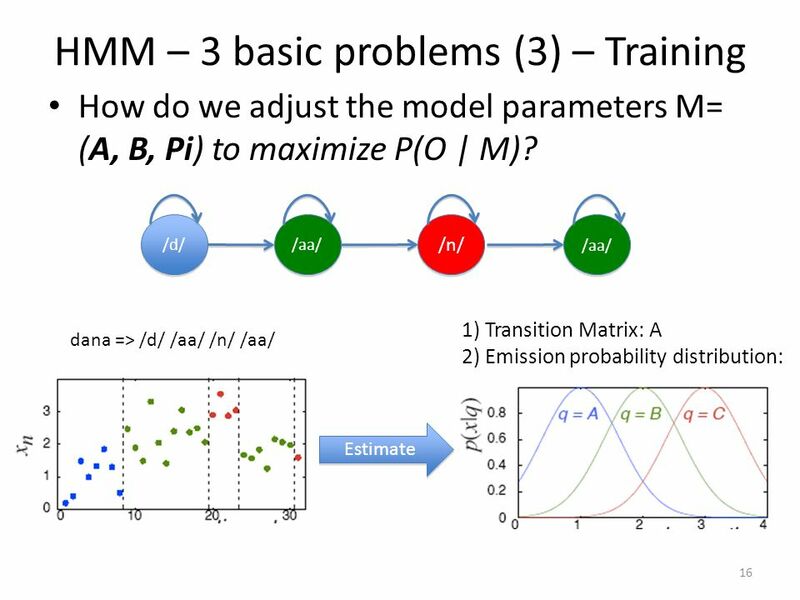 Sequential Modeling with the Hidden Markov Model Lecture 9 Spoken Language Processing Prof. Andrew Rosenberg. 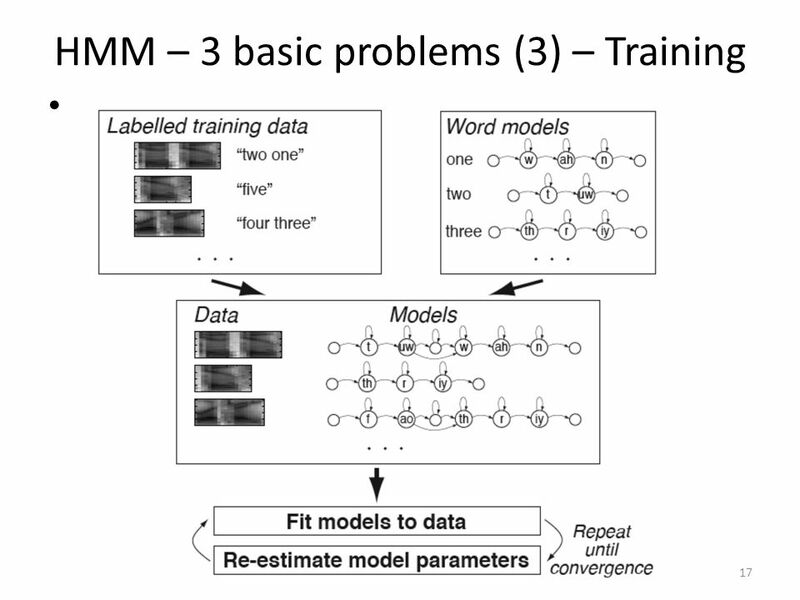 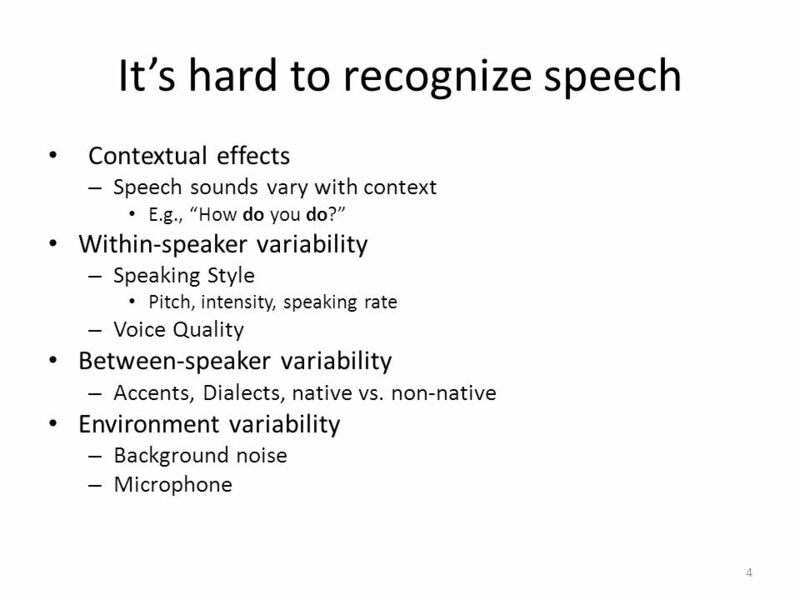 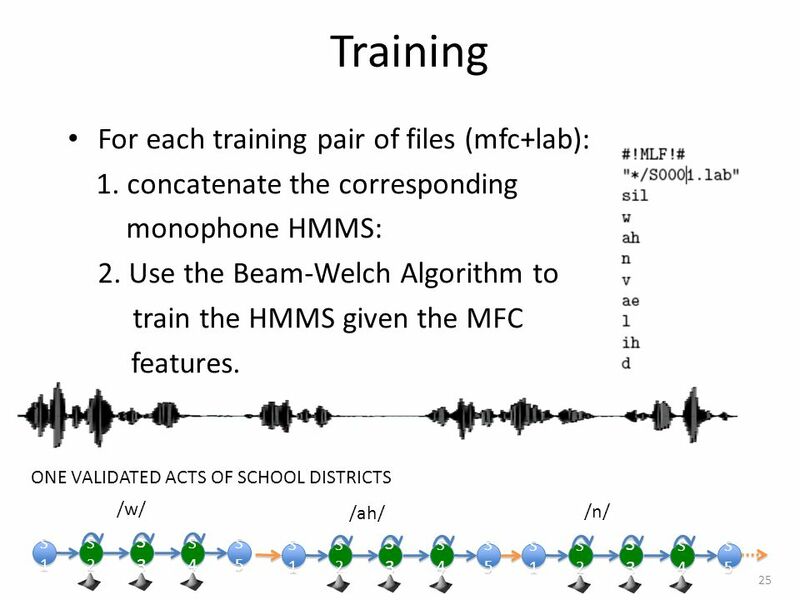 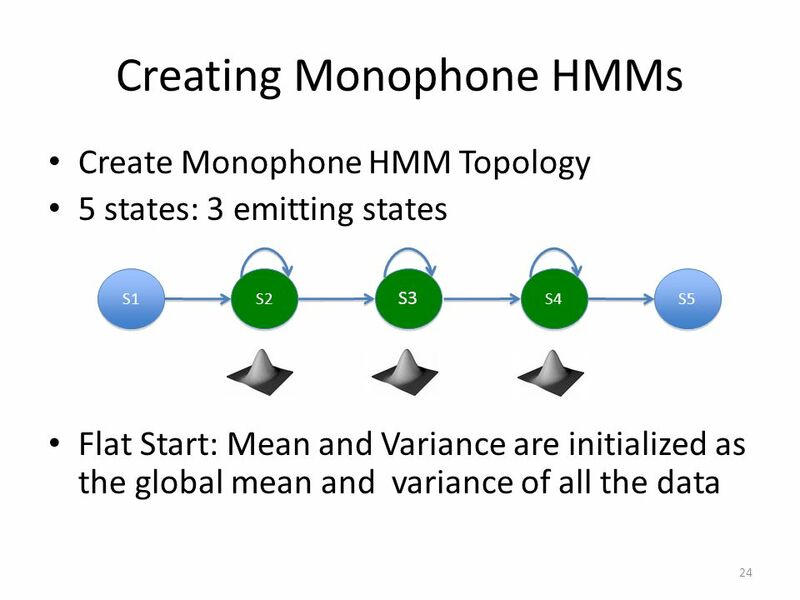 Application of HMMs: Speech recognition “Noisy channel” model of speech. 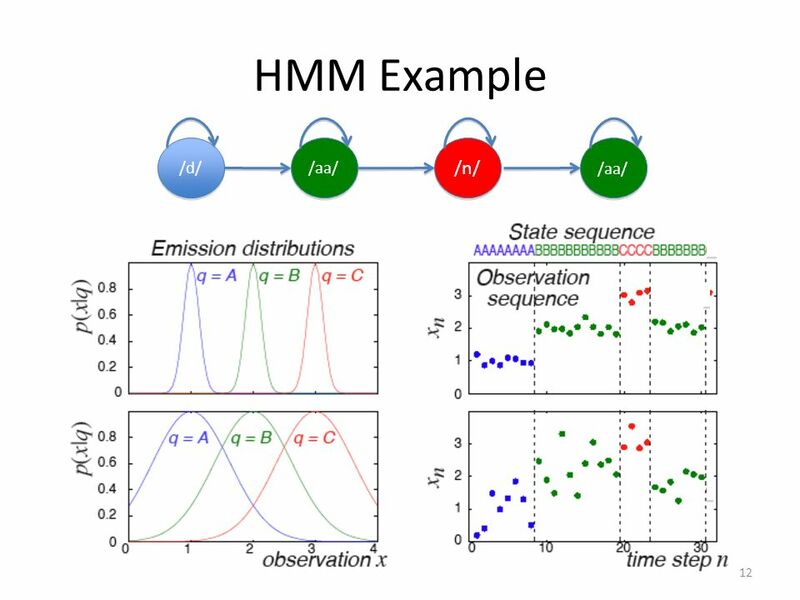 HMM-BASED PATTERN DETECTION. 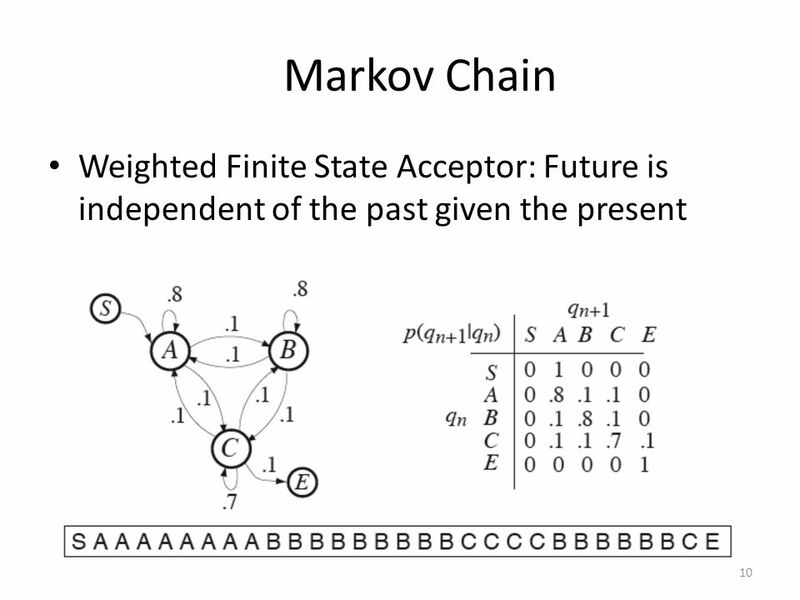 Outline  Markov Process  Hidden Markov Models Elements Basic Problems Evaluation Optimization Training Implementation 2-D.
Hidden Markov Models. 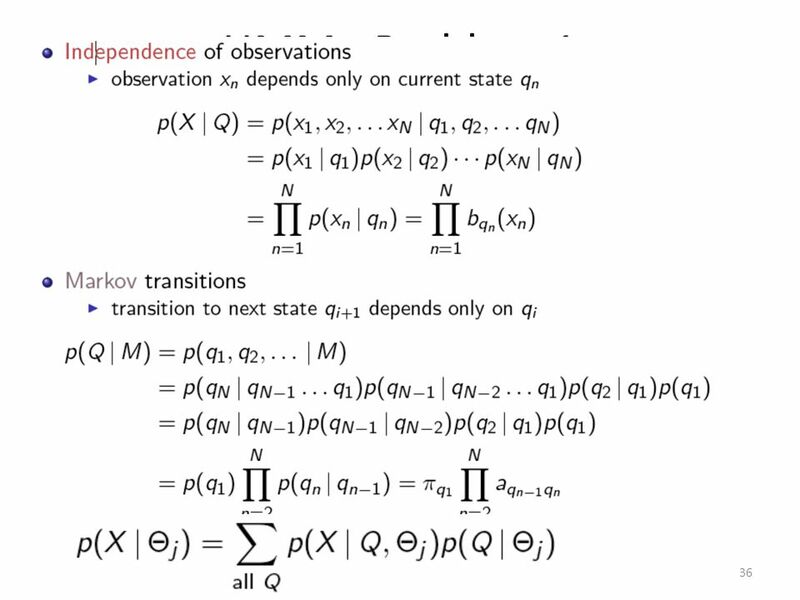 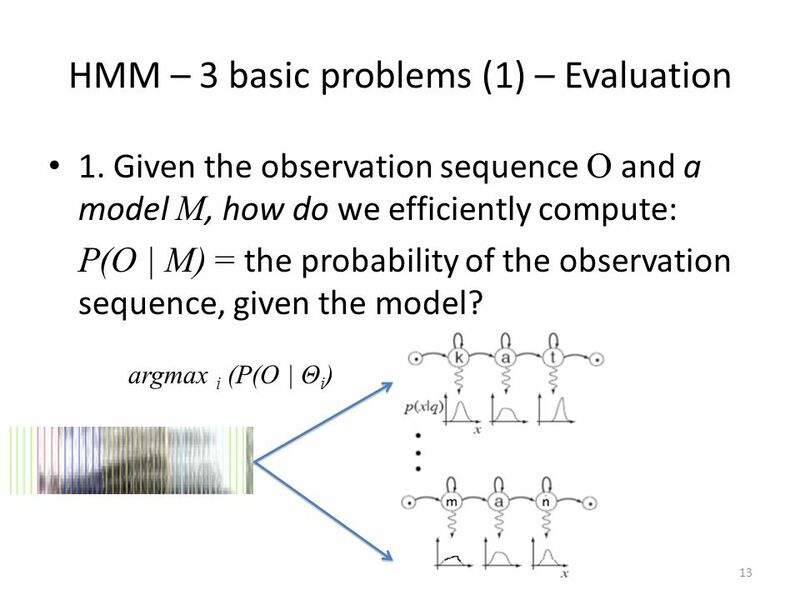 Hidden Markov Model In some Markov processes, we may not be able to observe the states directly. 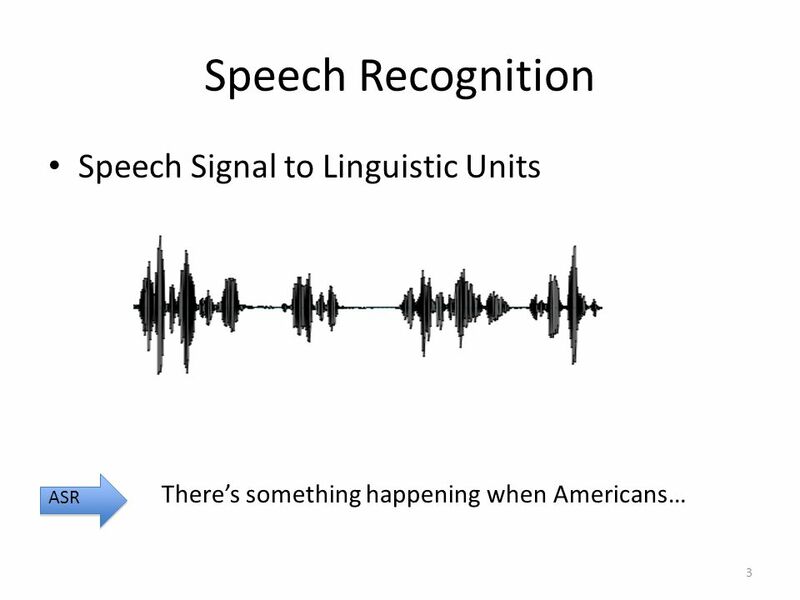 CS 188: Artificial Intelligence Fall 2009 Lecture 21: Speech Recognition 11/10/2009 Dan Klein – UC Berkeley TexPoint fonts used in EMF. 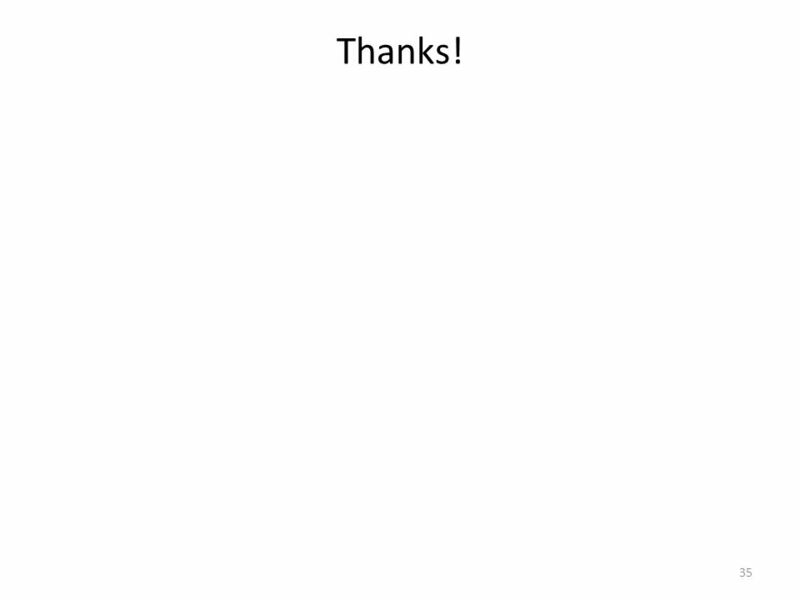 Read the TexPoint. 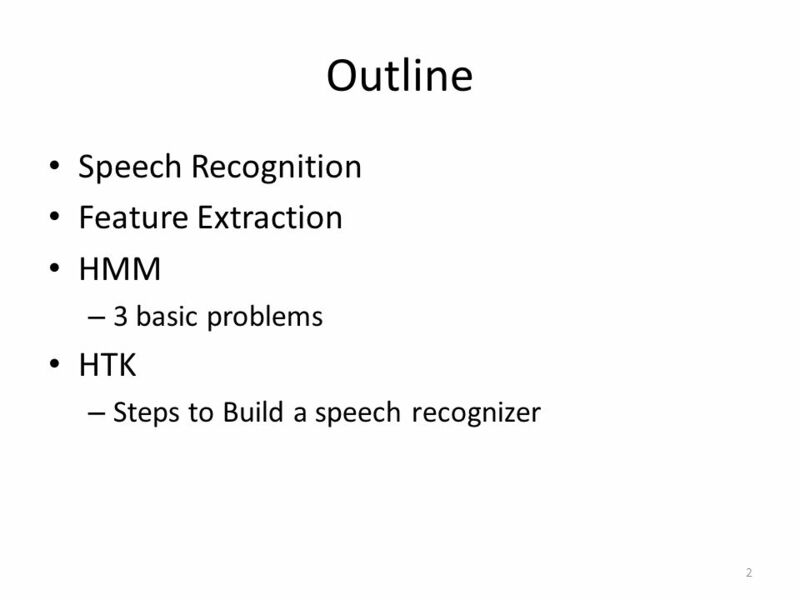 COMP 4060 Natural Language Processing Speech Processing.